Seems a strange analogy but to the technical stuff first. It may seem obvious but why is it that serve dominates in professional tennis? Players serve and in most professional matches, particularly when the players are evenly matched serve is held more times than it is broken. This holds true for slower surfaces like clay, as well as traditionally faster surfaces like grass. Based in recent stats the average rate of holding serve on the ATP Tour is 81.2%. So why is that the case? Essentially, when serving it is the one time that you can control what you do without having to react to what’s coming at you. It’s the time when you can set up the point. Let’s look at some of the tactics of players in recent history when serving? When Federer serves, his go to first serve from the deuce court (the right) is a slice out wide. If it’s not an ace, most of the time it puts the opponent under pressure and opens up the court. From this point he can then move his opponent around and it takes exceptional defence to wrest the advantage away. In a similar vein Nadal, as a left hander, will serve out wide from the ad court, particularly against Federer, where his backhand is not as strong but, more importantly, as with Federer, it sets up the point, allowing him to remain in control. Stefan Edberg, one of the great serve and volley players, when serving from the deuce court would often hit a kick serve down the middle, when playing a right-hander. 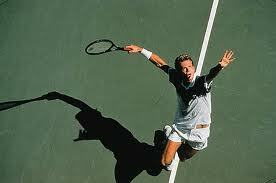 With Edberg he would constantly serve and volley, whether on grass, clay or hard courts. By hitting a high kicking serve down the middle he was playing a ball that the receiver would often have to hit at shoulder height. At this height it is very difficult to keep the ball low and Edberg would be counting on a relatively easy first volley to end the point. So what of the meeting analogy? think about each participant and what their state of mind is about what you want to achieve – does it need changing and how? preparation – all this points to rigorous preparation for meetings, in that way you’ll achieve more with less.